I recently has a request from Kylie, one of my dad’s cousins, to write about a gecko, so today I am writing about the New Caledonia giant gecko. These large lizards grow up 36 cm long, making them the longest geckos in the world. Due to their size, they are one of the top predators on the island where they live. 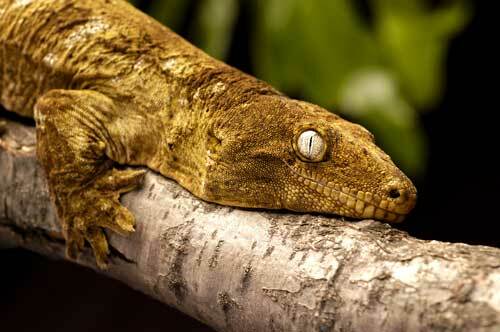 New Caledonia giant geckos have a stumpy body and a short stubby tail. Males often fight with each other, causing their tails to fall off. The tails grow back, but never as long as their first tail. They come out of hiding at night to hunt in trees, catching insects, spiders and other geckos. They also climb down to the ground to eat fruit that has fallen to the forest floor. Like other geckos, they have special pads on their feet that enable them to climb steep, slippery surfaces. As their name suggests, New Caledonia giant geckos are found in the forests of the Pacific island of New Caledonia, where they are quite common. Are there any other interesting facts that you would like to share about New Caledonia giant geckos? Thank you so much for this Hayden. I love it.